The article published on Sunday has been branded “sexist” and “anti-Semitic”. JOURNALIST KEVIN MYERS has spoken out for the first time since his controversial Sunday Times column was criticised – and admitted that he deserved to be fired. Speaking on Today with Sean O’Rourke on RTE Radio 1 this morning, Myers issued an apology for the column, which has been branded as “sexist” and “anti-Semitic”. “I am the author of that article, I am the author of my own misfortunes, I am the master of my soul,” Myers told presenter Sean O’Rourke. The opinion piece, which appeared in the Irish print edition, was critical of recent calls for equal pay for men and women in media organisations after the BBC published its list of highest-paid stars and only one woman made the top 10. On Sunday afternoon, the online version of the article was removed, and both editors of the British and Irish editions issued apologies. Myers told O’Rourke today that he had been informed by The Sunday Times in London that he had been fired from the publication on Sunday afternoon. 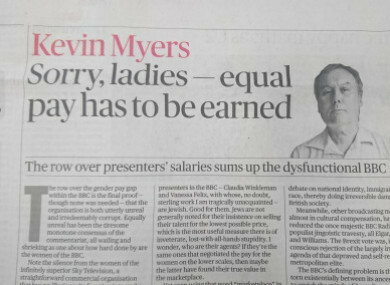 Myers issued an apology to the women, Claudia Winkleman and Vanessa Feltz, over the column. “I am very, very sorry to them, I really mean it, I’m not rescuing anything as far as I can see, it’s over for me. “I am issuing an apology for no other reason than the contrition of the hurt I have caused them,” he said. Yesterday, BBC presenter Vanessa Feltz described the column as “horrifying racism”. This morning, Myers went on to deny that he is misogynistic or anti-Semitic. I’m not misogynistic, I’m a critic of political feminism but I’m not misogynistic. “[Misogyny] is a simple way of labelling someone who means you don’t have to listen to what they have to say. I don’t believe in equality. Earlier in his chat with O’Rourke, Myers said that he was a “great admirer of the Jewish people”, stating that he thinks “they are the most gifted people who have ever existed on this planet”. Yesterday, the Press Ombudsman confirmed to TheJournal.ie that four complaints were lodged in relation to the column. A spokesperson for the Independent Press Standards Organisation, the independent regulator for the newspaper and magazine industry in the UK, also confirmed to TheJournal.ie that it received a total of 25 complaints. Email “'I must answer for what I've done': Kevin Myers breaks silence and issues apology over offensive column ”. Feedback on “'I must answer for what I've done': Kevin Myers breaks silence and issues apology over offensive column ”.